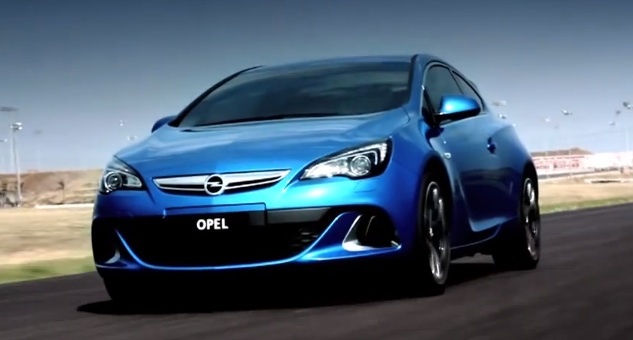 Holden has confirmed production of the Opel-based vehicles has commenced at Opel’s Rüsselheim, Germany plant, but it seems a few have already made their way down under for testing. One eagle-eyed local spotted the pack of new Holdens fueling at a petrol station, and snapped a few photos. The Opels are doing their best to seem local, painted in bright hues fit for Aussie consumers and spied for the first time wearing no camouflage and badged with the roaring lion. Holden will officially release the Insignia OPC (VXR), Astra OPC (VXR) and Cascada sometime this June and will represent a more premium offering in the lineup before the rebadged Opels make up some thirty percent of the brand’s offerings. Motoring AU speculates Korean offerings will comprise the rest of the lineup post-2017 with the possibility for a few U.S. made products, such as the next-generation Camaro or Corvette Stingray. An all-new luxury SUV will also be sourced from Opel to likely replace the ho-hum Captiva and sit atop the Colorado and Colorado 7 range. For sporty sedan fans, the Insignia VXR will offer a Melbourne-made 2.8-liter turbo V6 mated to a six-speed automatic and all-wheel drive. The Insignia is expected to be priced around $60,000 AUD, so it won’t be cheap by any means, but Holden hopes it introduced a new blend of sport, luxury and handling previously unseen in the brand’s portfolio. The Aussie publication also got word on GM having Australian Design Rule for one more Opel based vehicle, most likely an Astra-basde Zafira people mover or Trax-based Mokka SUV. We must say, the cars do sort of look right at home with the Holden badges and bright paint colors, especially the Astra which already looks darn good to begin with. Time will tell how Aussie consumers react to the shift as Holden introduces 24 new models by 2020. Welcome to the party, Australia. I see this as a good thing. The sun will now never set on people asking GM for fast, rear-wheel-based sedans at affordable prices. Good luck with the $48k Insignia. That’s Cadillac CTS VSport money. Sorry, sorry… I forgot… you guys don’t get that either. And you lost Dodge. And the Genesis is skyrocketing in price. I’m glad I’m in America now. Thanks guys. Australia has a different tax system and policies, along with prices. so different from the other countries in terms of their specific features. can not compare the prices of different countries. However, things are in place in each country. Australia is one of the specific nature of the location and right-hand drive. cars are transported to Australia from around the world is more complicated and more expensive as well. and many more things. Europe and America differ from the prices of cars. all this is not an easy topic to discuss. Australia Australia the corresponding prices in all cases. each country has its own well-established prices. But with some of the goods may be more difficult and costly situation. All of which was offset by two things: Falcon and Commodore. I used to have good RWD sedans to compare to. Now America has a clear edge with CTS, Charger, Challenger, Camaro… oh, and Corvette. Well, yeah, if you’re an Australian… you’re reaching for a bottle. Sadly Christopher im an Aussie, the only thing im reaching for is anything but a FWD GM product. Once true Aussie muscle dies in 2017 so does my loyalty to GM. Its not personal or even hateful, I just don’t want a FWD daily driver with no V8. Its a shame to as i purchased a new model every year or 2nd year. Oh well gotta move with the times and find a new go fast RWD V8, GM’s Camaro and Corvette aren’t an option on principle. What man would purchase a vehicle off the same company that killed his favorite car? Post 2017 I intend to shop the entire market. Brand loyalty is no longer a given! Irrespective of the situation in the US, after 2017 in Australia it appears that GM will no longer offer any products which are in any way relevant to my wants or needs as a car buyer. I have little interest in a FWD sedan and even less in any sort of SUV. If anything, in the absence of a large RWD sedan to buy, I am likely to move on to extreme practicality and get some sort of people mover (what you US guys would call a minivan) – which GM doesn’t offer either. Camaro and Corvette are irrelevant to me as I can’t use either of these cars as family transport. Sell them here or don’t, doesn’t matter. For a long term GM buyer, this is a disappointing state of affairs but it is what it is. Actually GM does offer various Minivans – from the Chevrolet Suburban over the trio of Buick Enclave/Chevrolet Traverse/GMC Terrain to the Opel/Vauxhall Zafira and Meriva and finally the Chevrolet Spin. Maybe none of those is offered (yet) in Australia and New Zealand, but the general “GM doesn’t offer” is not true. We in America feel for you as we have been there done that. We thought we were going to lose all the RWD models at one point. We thought we would never have any more V8 models and we though performance was gone. Today we have cars we could never had imagined 30+ years ago in the days of the 180 HP Vette. We survived the year of no Corvette in 83, the lost of the Camaro and Firebird and we have learned that we have some really good cars. Even the base cars have more HP and handling than the performance cars of out past. I will warn you now to not let your bitterness over come you because of one model that has had declining sales. Give them the time and chance to turn things around and you will look back as we did on our years gone by and find that things are much better today than back then. Just ask someone that owns a new Camaro today vs. the crossfire injected Z28 they owned then. If you are indeed genuine in your empathy for how us Aussies feel Scott3 i thank you, I also don’t expect an American to understand the significance of only having 3 local car producers in a country the size of Australia that are shutting up shop on our shores, sacking many fellow Aussies and importing cars that the loyalists just simply don’t want. Its not bitterness Scott3 just plain and simple GM wont have a model that fills the gap of the car were losing. What i find sad is that Holden will end up in 10 years time with no more cultural significance or local appeal than Mazda, Nissan, Honda etc etc etc. The only Holden culture left will be in car club meetings which i can tell you now that if you bring an imported FWD Commodore to that it will end up keyed, kicked and possibly on fire. I appreciate what you are saying Scott3, of course cars are better than they were 30 years ago. But I’m not sure if you realize that one of the performance V8 models you have today, the Chevy SS, is a LHD Holden Commodore and a little known fact is the new Camaro of today you refer to was engineered at… You guessed it… Holden in Australia. Why? Because we were bloody good at it! So I think we have a right to be a little bitter about the whole thing. You guys gain a RWD V8 supercar and we get an imported FWD losercar. Who’s the winner? Not us! Cars appear overpriced in Aus and whilst they aren’t as cheap as they are in America for economies of scale reasons, our wages/salaries compensate a fair bit. Porsche are the only real shockers being 4 times their US price as opposed to the normal $20k difference. Scott3 – I think you are missing the main point. You guys keep your manufacturing base, while we dip out on localized product. While large cars are declining, Commodore still sells well and regularly achieves top 5 sales. We have a long history of great product, unlike some of the examples you refer to as being historically below par i.e. Brock HDTs, HSVs and SSs. The future crop does not inspire me as I have very firm needs – RWD, four door and V8 powered. This will not be achieved with the overseas products. Call me a dinosaur but I know what I want and will not get it post 2017. For what it’s worth Chrysler is moving more to compete with Buick, and plans to continue the Chrysler 300 as it moves downmarket. So you do have one car. Caveat: The are rumors the next-gen 300 will not move to the LA Platform and will instead move to FWD to compete head-on with LaCrosse and Regal as a LWB FWD car.